1. Even though the crews are working in your section, it does NOT mean they will be on your street every day. Pick up will be done on a revolving basis within the scheduled section. We are unable to predict what day/time that we will be on your street. The City CANNOT guarantee that all leaves placed on the parkway near the end of the program will be picked up. For this reason, we ask for your cooperation in raking early and encourage the use of Waste Management’s services. 2. To assure pick up, have your leaves raked out on the parkway as close as you can to the back edge of the curb. The suction hoses on the machines can only reach so far. DO NOT rake leaves into the street. Leaves placed in the street can cause safety problems for vehicular traffic along with potential flooding. 3. Rake leaves into loose rows/piles. Leaves containing branches, brush, grass clippings, animal waste or other debris will NOT be picked up. 4. Vehicles blocking piles of leaves, will prevent them from being picked up. 5. Avoid raking leaves near catch basins, culvert pipes or into ditches. This can cause severe flooding problems in the event of heavy rain. 6. Do not wait until all of your leaves have fallen to begin raking. 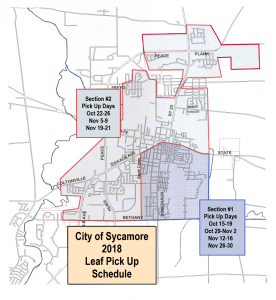 The Leaf Pick Up Program may come to an early end upon snowfall. We encourage residents to rake early and rake often. 7. Waste Management collects yard waste until the end of November. Leaves may be placed in a biodegradable Kraft paper bag, or a dedicated container marked “landscape waste only” (plastic bags are not acceptable). Bags will be pickup on your regularly scheduled collection day. Bags must weigh less than 50 pounds. 8. 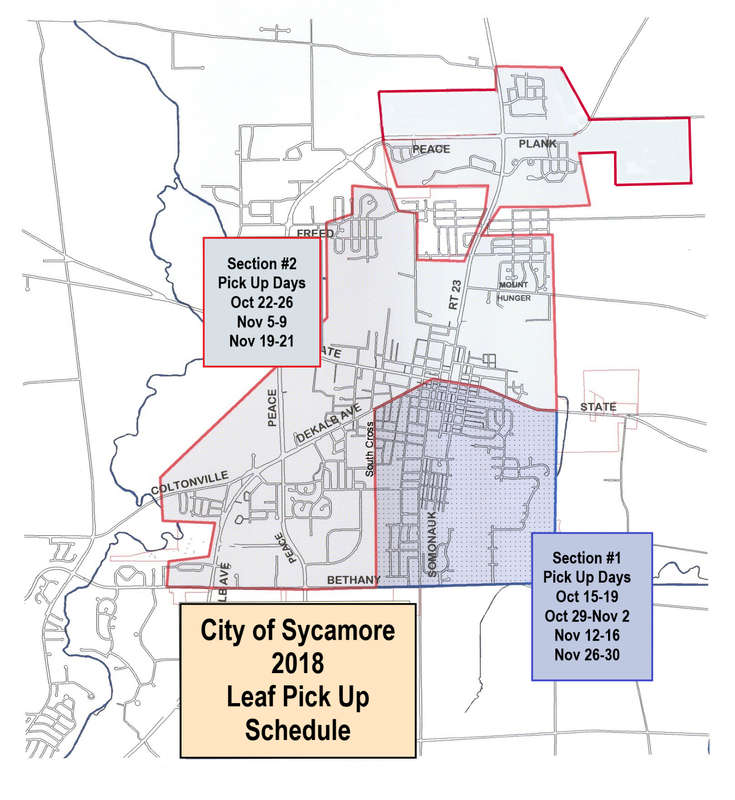 From December 1st to December 16th, leaves can be brought to the Public Works facility at 475 North Cross and placed in a dumpster. Leaves must be in Kraft paper bags. Only leaves will be accepted. Please call Public Works, 815-895-3545 for location. Any additional questions, please call the Sycamore Public Works at 895-3545.